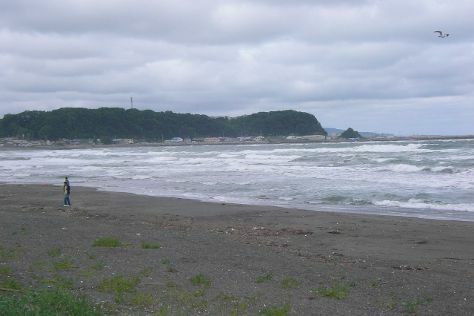 Get outdoors at Shiretoko Beach and Shiretoko National Park. Get out of town with these interesting Shari-cho side-trips: Lake Rausu (in Rausu-cho) and Kitanemuro Ranch Way (in Nakashibetsu-cho). The adventure continues: identify plant and animal life at Shiretoko Peninsula, take in the dramatic scenery at Oshin Koshin Falls, cruise along Road to Heaven, and explore the activities along Shiretoko Goko Lake. To see photos, reviews, where to stay, and tourist information, use the Shari-cho route builder app . Rio de Janeiro, Brazil to Shari-cho is an approximately 39-hour flight. The time zone difference moving from Brasilia Time (BRT) to Japan Standard Time (JST) is 12 hours. In October, Shari-cho is colder than Rio de Janeiro - with highs of 16°C and lows of 9°C. Wrap up your sightseeing on the 7th (Mon) to allow time to travel to Tokyo. Give yourself a bit of retail therapy at Ginza and Harajuku Takeshita-dori. Have a day of magic on the 13th (Sun) at Tokyo Disneyland. The adventure continues: wander the streets of Odaiba, contemplate in the serene atmosphere at Senso-ji Temple, enjoy breathtaking views from Tokyo Skytree, and take in nature's colorful creations at Shinjuku Gyoen National Garden. Plan trip to Tokyo with our itinerary maker to find out where to go and what to do. Getting from Shari-cho to Tokyo by combination of taxi and flight takes about 4.5 hours. Other options: take a train; or do a combination of car, bus, and train. Traveling from Shari-cho in October, things will get a bit warmer in Tokyo: highs are around 26°C and lows about 18°C. 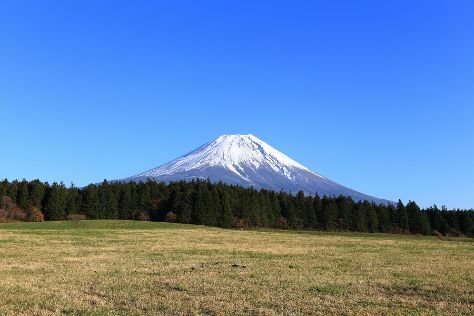 Cap off your sightseeing on the 13th (Sun) early enough to go by car to Fujikawaguchiko-machi. Step out of the city life by going to Mount Fuji and Fuji Hakone Izu National Park. Explore Fujikawaguchiko-machi's surroundings by going to Fuji (Tago no Tsuki Honten & Nature & Wildlife Tours), Mt. Shakushi (in Fujiyoshida) and Yamanashi (Mt. Kobu-shigatake & Nishizawa Valley). There's more to do: explore the activities along Lake Kawaguchi and take a peaceful walk through Kawaguchiko Sozo-no-Mori. To find more things to do, where to stay, ratings, and other tourist information, read our Fujikawaguchiko-machi day trip planning app . Drive from Tokyo to Fujikawaguchiko-machi in 2 hours. Alternatively, you can take a bus; or do a combination of subway and bus. While traveling from Tokyo, expect a bit cooler days and about the same nights in Fujikawaguchiko-machi, ranging from highs of 19°C to lows of 17°C. Finish your sightseeing early on the 18th (Fri) so you can drive to Kyoto. Give yourself a bit of retail therapy at Dotonbori and Kyoto Station Building. Get out of town with these interesting Kyoto side-trips: Nara (Kofuku-ji Temple & Nara Park). There's lots more to do: wander the streets of Gion, steep yourself in history at Sanjusangendo Temple, take an in-depth tour of Kyoto Museum of Traditional Crafts Fureaikan, and go for a walk through Arashiyama. For maps, reviews, where to stay, and more tourist information, you can read our Kyoto online day trip planner . You can drive from Fujikawaguchiko-machi to Kyoto in 4.5 hours. Other options are to do a combination of bus and train; or do a combination of bus, flight, and train. While traveling from Fujikawaguchiko-machi, expect somewhat warmer days and about the same nights in Kyoto, ranging from highs of 27°C to lows of 18°C. Finish up your sightseeing early on the 23rd (Wed) so you can catch the train to Hatsukaichi. Your itinerary includes some good beach time at Mikasahama Beach and Takahama Coast. Step out of the city life by going to Miyajima and Nijigahama Beach. Explore Hatsukaichi's surroundings by going to Matsuyama (Matsuyama Castle & Thermal Spas). There's much more to do: steep yourself in history at Itsukushima Shrine, take your sightseeing to a higher altitude at Mt. 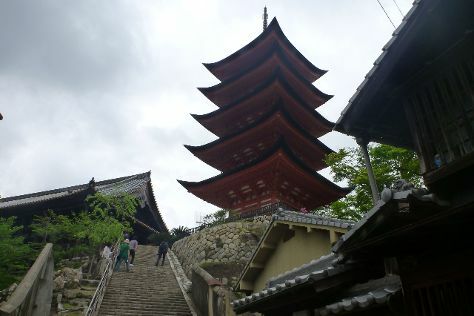 Misen, take a peaceful walk through Misen Wild Woods, and stop by Itsukushima Gekijyo. To see where to stay, ratings, and tourist information, read Hatsukaichi journey builder app . Traveling by train from Kyoto to Hatsukaichi takes 2.5 hours. Alternatively, you can drive; or do a combination of bus and train. In October, plan for daily highs up to 26°C, and evening lows to 19°C. Finish your sightseeing early on the 27th (Sun) so you can travel to Setouchi-cho. 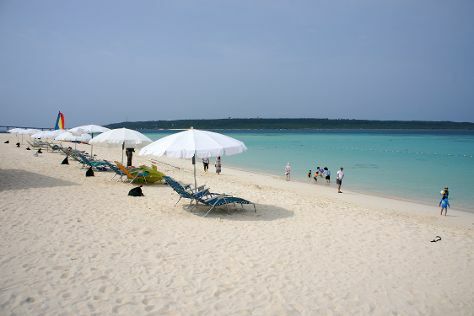 We've included these beaches for you: Dokuhama Beach and Sanekukai Beach. Visiting Shirahama Beach and Honohoshi Beach will get you outdoors. To find maps, reviews, and tourist information, go to the Setouchi-cho trip itinerary planner. You can drive from Hatsukaichi to Setouchi-cho in 22 hours. Another option is to fly. Expect somewhat warmer temperatures when traveling from Hatsukaichi in October; daily highs in Setouchi-cho reach 32°C and lows reach 28°C. Finish your sightseeing early on the 30th (Wed) to allow enough time to travel to Nakijin-son. Steeped in Ryukyuan history, Nakijin-son tourism centers around the ruins of an ancient stonewall castle. Escape the urban bustle at Akabaka Beach and Okuma Beach. 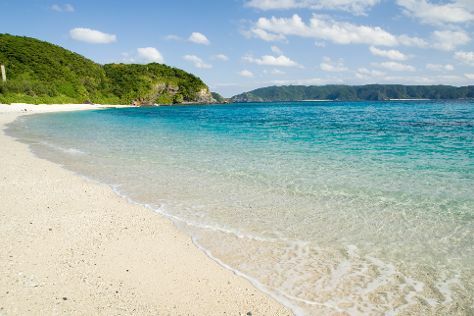 Visit Yurigahama and Paradise Beach for some beach relaxation. Change things up with these side-trips from Nakijin-son: Terasaki Beach (in Yoron-cho), Ie-son (Iejima Beach Side Horse Park & GI Beach) and Nago (Sea Glass Beach, Kise Beach, & more). The adventure continues: enjoy the sand and surf at Yonamine Nagahama Beach, admire nature's wide array of creatures at Okinawa Churaumi Aquarium, and make a trip to Kouri Bridge. To see reviews, more things to do, ratings, and other tourist information, read our Nakijin-son trip planner . Drive from Setouchi-cho to Nakijin-son in 12.5 hours. In October, plan for daily highs up to 33°C, and evening lows to 26°C. Wrap up your sightseeing on the 4th (Mon) early enough to travel to Zamami-son. The village of Zamami-son in the western Kerama Islands spans four of the islands in the group, one of which remains uninhabited. Get outdoors at Gahijima Sand Dune and Aharen Beach. Relax by the water at Furuzamami Beach and Nishibama Beach. Venture out of the city with trips to Kumejima-cho (Tsumugi Bridge & Hatenohama). There's still lots to do: tour the pleasant surroundings at Hizushi Beach, kick back and relax at Aka Beach, and head off the coast to Geruma Island. To see other places to visit, reviews, more things to do, and tourist information, read our Zamami-son trip app . The Route module can help you plan travel from Nakijin-son to Zamami-son. Expect a bit warmer evenings in Zamami-son when traveling from Nakijin-son in November, with lows around 24°C. Finish your sightseeing early on the 9th (Sat) to allow enough time to travel to Ishigaki. Your itinerary includes some good beach time at Yonehara Beach and Akashi Beach. Give yourself a bit of retail therapy at Pinion Direct Shop and Nei Museum of Art. The adventure continues: tour the pleasant surroundings at Kondoi Beach, glide peacefully along the water with some of the best stand-up paddleboarding in the area, visit a coastal fixture at Cape Hirakubozaki, and kick back and relax at Sunset Beach. For other places to visit, ratings, and other tourist information, refer to the Ishigaki day trip website . Explore your travel options from Zamami-son to Ishigaki with the Route module. Expect a daytime high around 31°C in November, and nighttime lows around 25°C. Wrap up your sightseeing on the 15th (Fri) early enough to ride a ferry to Iriomote-jima. Take a break from the city and head to Nakano Beach and Todomari Beach. Relax by the water at Ida no Hama Beach and Hoshisuna Beach. There's much more to do: scramble along the landscape with a canyoning and rapelling tour, take in the dramatic scenery at Mizuochi Falls, get outside with Iriomotejima Kaigetsu, and look for all kinds of wild species at Funauki Village. To see more things to do, reviews, ratings, and tourist information, you can read our Iriomote-jima holiday planning site . You can ride a ferry from Ishigaki to Iriomote-jima in an hour. Expect a daytime high around 31°C in November, and nighttime lows around 25°C. Wrap up your sightseeing on the 20th (Wed) early enough to ride a ferry to Miyakojima. Escape the urban bustle at Yonaha Maehama Beach and Sunayama Beach. Relax by the water at Hora Gyoko no Hama Beach and Toguchi no Hama. 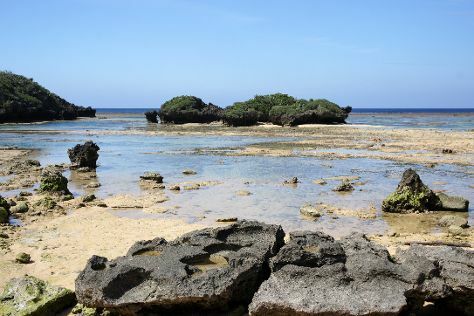 The adventure continues: kick back and relax at Aragusuku Beach, tour the pleasant surroundings at Boraga Beach, and see the vivid underwater world at Yabiji. To find where to stay, more things to do, and more tourist information, read our Miyakojima trip planner. You can ride a ferry from Iriomote-jima to Miyakojima in 4 hours. November in Miyakojima sees daily highs of 30°C and lows of 24°C at night. Cap off your sightseeing on the 28th (Thu) early enough to travel back home.